How can a support ticket system help improve your customer service efforts? Read on to find out. Running a business goes hand-in-hand with customer interaction. This can be via phone or email. These interactions, regardless of the channel, need to be treated with extra care—and doing so without the right tool might make things more complicated than necessary. To start with, you need a way to conveniently store and pull up previous customer interactions to maintain context in case the customer comes back with the same, or more questions. Doing so across all the channels that they use to reach out to you helps you build better customer relationships. This is just scratching the surface of what customer support software can help you do. Here's a comprehensive guide to understand what else is possible. So, what is customer support software? Customer support is generally defined as service efforts from companies that focus on helping customers use products and services correctly. It also takes care of general post-sale follow-up, ensuring that customers are happy with their purchase. Do so with a rapidly expanding customer base, however, requires regular maintainance of customer data on a secure platform. With a customer support tool in place to streamline your customer care, managing multiple customer interactions gets easier. This includes conversations spread across various channels like email, phone, social media, live chat, and more, all from a single interface. A customer support help desk also helps you manage your routine tasks better and save time—along with reports that help you analyze the effectiveness of your efforts. What size does a business have to be before they need a customer support software? Whether you're a one-person company or a multinational giant, using customer support software gives you a lot to gain. A support system arranges your tickets based on channel, priority, or agent. This reduces time spent on deciding which ticket needs immediate attention. Some customer issues require immediate attention, whether or not you're at your desk. A mobile-ready customer support software will help you stay on top of your game, no matter where you are. With the right customer support software, you can request, track and act on customer feedback end-to-end. Manually assigning every ticket that comes in creates bottlenecks, and leaves several tickets unassigned at any given point of time. With effective automations rules, these routine tasks are taken care of by the software based on your priorities and requirements. Customer support and resource management go hand-in-hand. 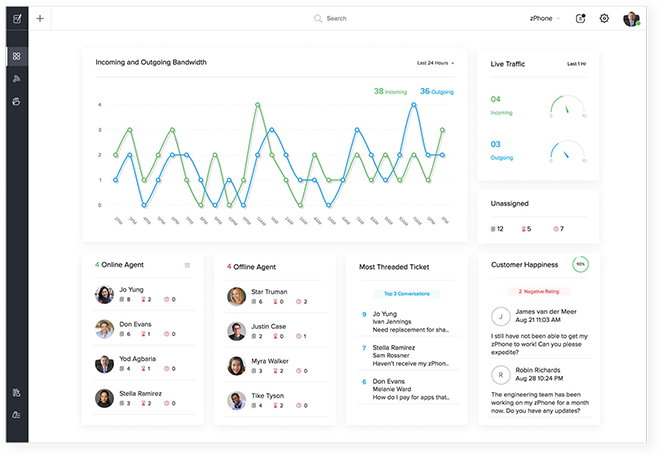 Customer support tools help you monitor and analyze your agent's efforts, the time taken to reach a resolution, ticket traffic trends and more. Having the right data helps identify areas for improvement and increase team productivity. Your support agents often depend on other teams to help customers with their issues. 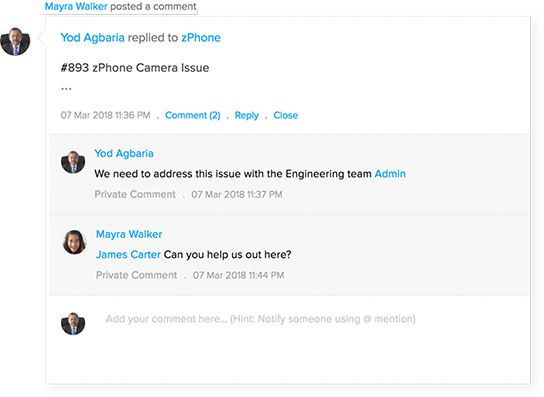 A customer support system comes with collaborative features that allow your agents to communicate the issues with other teams, no matter where they are. This also reduces repetition of information and miscommunication, as all interactions are streamlined to one place. The larger your company gets, the harder it is to implement and stick to your processes. However, customer support ticketing systems come up with advanced process management tools, that help you create and manage your processes on the cloud. Automating your process implementation means more discipline and without the need for supervision. Progress only comes with identifying and fixing problems that come up in your customer support process. To do so, you need the right data at the right time. Customer support system provides you the required data, represented in tables or charts—just the way you need them. Customer information that you collect needs to be well protected to ensure strict confidentiality. A support tool ensures you are well-equipped to handle all that data with a host of access and data security features. A customer support system arranges your tickets based on channel, priority, or agent. This reduces time spent on deciding which ticket needs immediate attention. With the right software, you can request, track and act on customer feedback end-to-end. Customer support and resource management go hand-in-hand. 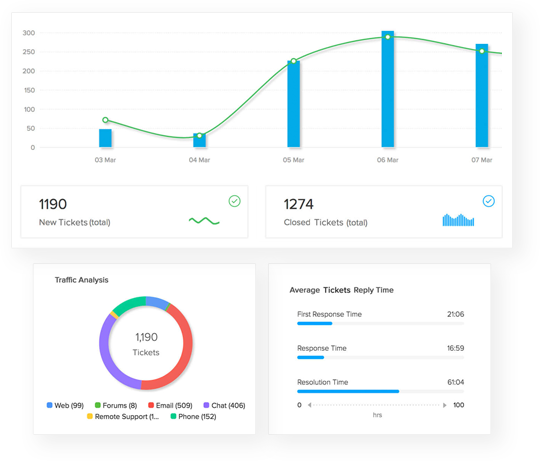 Customer support tools help you monitor and analyze your agents' efforts, the time taken to reach a resolution, ticket traffic trends and more. Having the right data helps identify areas for improvement and increase team productivity. Your support agents often depend on other teams to help customers with their issues. 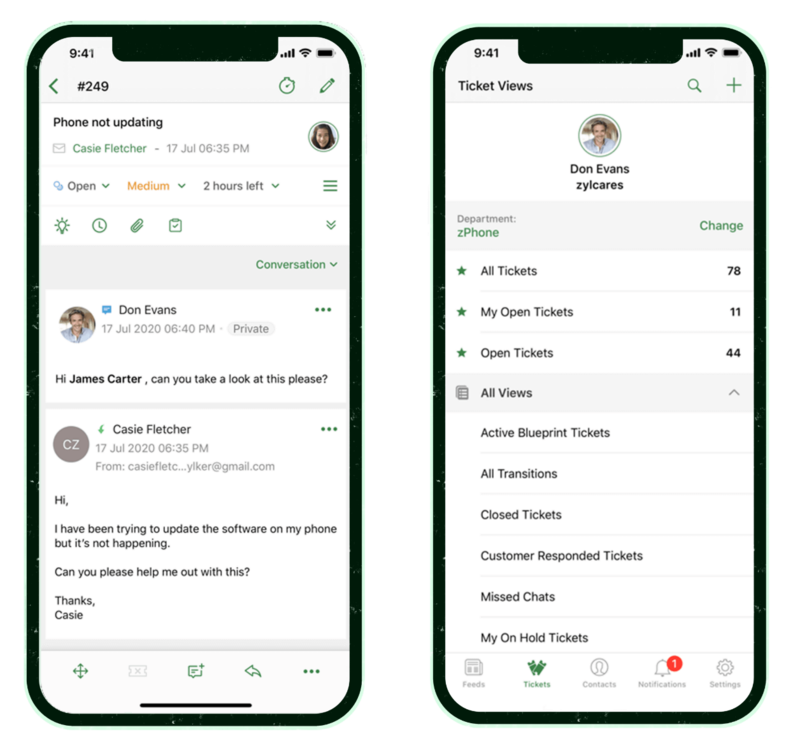 A ticketing tool comes with collaborative features that allow your agents to communicate the issues with other teams, no matter where they are. This also reduces repetition of information and miscommunication, as all interactions are streamlined to one place. The larger your company gets, the harder it is to implement and stick to your processes. 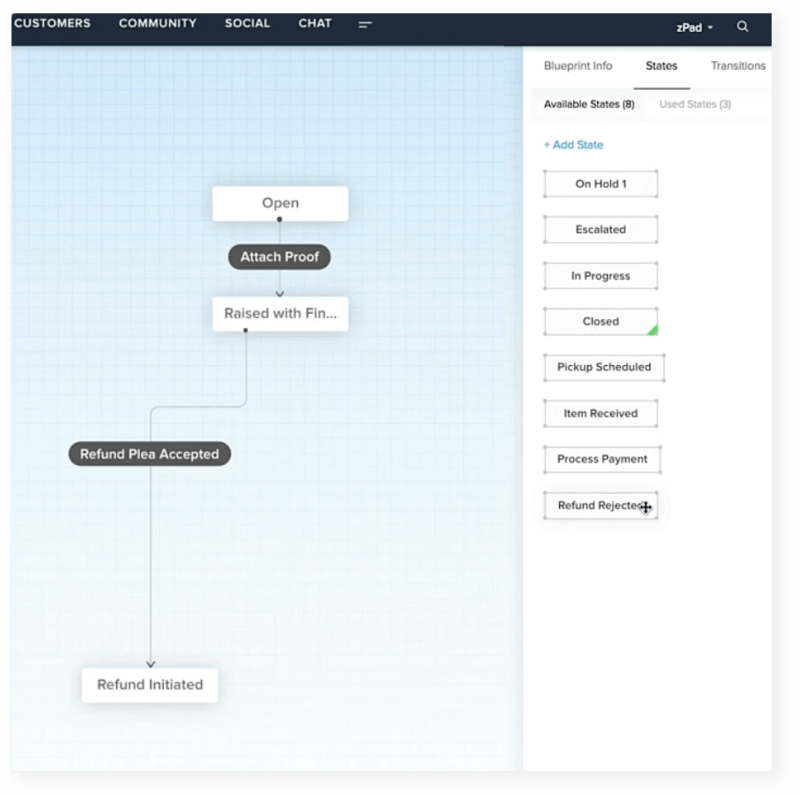 However, support ticketing systems come up with advanced process management tools, that help you create and manage your processes on the cloud. Automating your process implementation means more discipline and without the need for supervision. 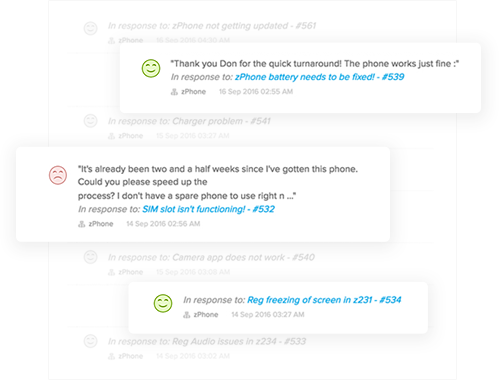 Progress only comes with identifying and fixing problems that come up in your customer support process. To do so, you need the right data at the right time. Help desk ticketing system provides you the required data, represented in tables or charts—just the way you need them. Supplement your customer support efforts with powerful help desk software. What does a good customer support software offer? Ticket management system comes with an array of features. Depending on what your business needs, you can choose the ones that make your process simpler. You can set up Help Centers that have a Knowledge Base—FAQs and articles that help your customers find answers without waiting for an agent. They can also communicate with each other via Communities and Forums. This helps common problems find an easy solution, while giving your agents more time to focus on the complicated issues. Routine tasks, though simple, consume precious time and slow things down.Things like sending notifications to customers and reminders to agents are tasks that can be easily automated through a customer support system. 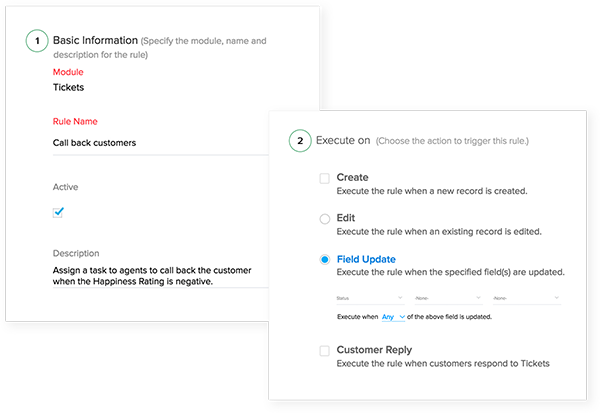 You set up automation rules once, and they handle daily tasks continuously, as long as you need them. With customer support software, you can ensure that every task gets assigned to the right person or team, based on each agent's domain of knowledge, your ticket traffic trend or even based on channel expertise.These actions could range from assigning tickets based on need and priority to organizing your agents into smaller teams. How does one choose the right customer support software? 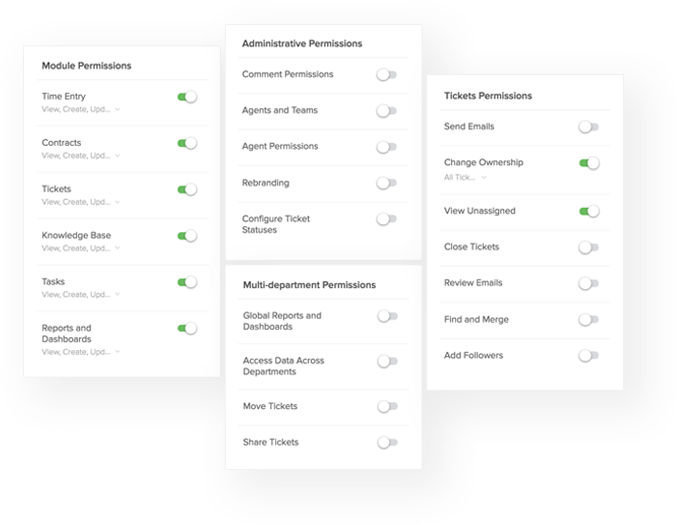 A multichannel support software collects all customer tickets from various channels and brings them together in one tab. This helps agents reply to all of them from the same place, without having to juggle between multiple windows. These channels include telephone, email, social media, live chat and web forms. Companies need to get their customer information sorted in order to gain useful insights. This is when software should step in—software that isn't just an online database of customer information. The best support software should be able to pull in sales information from your CRM, use AI to deduct the underlying sentiment, and enable your agents to respond to them properly. Linking your customer support software with other apps your company uses helps in the seamless transition of required data. 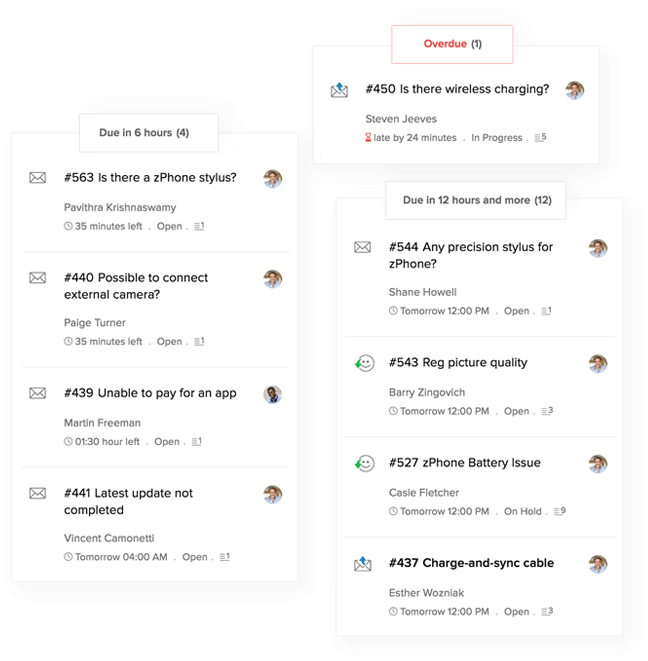 Project management apps, CRM software, calendar apps, email marketing apps, etc., integrated with your customer support software gives you a unified view of your customer information that was scattered across all these apps. The larger your customer base, the more customer data you need to protect. To maintain the safety of customer information, you need the help of a customer support software that is GDPR compliant and has enough encryption and security measures to safeguard your data. What if you don't like the customer support software after you buy it? There are a lot of options to choose from when it comes to customer support software, and almost all of them come with a free trial period or an open source version, including Zoho Desk, one of the industry's leading customer support solutions. You can evaluate and compare Zoho Desk with its contemporaries, take a look at pricing plans, and arrive at a decision yourself without spending anything. It definitely is worth the effort.